In just about every country where rice is consumed, some gloriously crispy form of it exists. There are Rice Krispies, duh; and then there's tahdig, the Persian mound of rice encased in crackly golden shell, which is very trendy now; soccarat, the crunchy layer of rice on the bottom of paella; yaki onigiri, crisp grilled Japanese rice balls; and dolsot bibimbap, the Korean rice dish served in a hot stone pot that's allowed to brown on the bottom before being stirred. Everyone loves some crispy rice. Here's one crispy rice preparation you may not have heard about much: risotto al salto. Hailing from Milan, Italy, risotto al salto is one of the easiest crispy rice dishes to make. Where tahdig and the soccarat on a paella require you to master the timing and technique to cook the rice through and perfectly brown the crust at the same time, risotto al salto breaks the process up into two easy steps. First you make risotto, ensuring the rice is cooked just right and the seasoning is spot-on. Then you fry your leftovers in a buttery pan until it forms a pancake that's crisp and browned on both sides. The word salto refers to the single flip you'll need to do midway through cooking it. You're most likely to see risotto al salto made using one of Milan's most famous risotto dishes, the saffron-hued risotto alla milanese. A simple risotto al parmigiano (risotto cooked with a meat stock and finished with butter and Parmigiano-Reggiano) is also a popular choice. While you can use a chunky risotto studded with mix-ins, they'll get in the way of a perfectly crackling crust of rice, and, depending on what they are, they may make it more difficult for the rice pancake to hold together. Your pan of choice for risotto al salto should be a skillet with sloped sides. 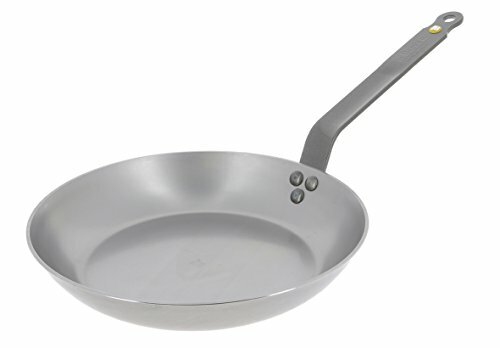 The straight sides of a cast iron skillet will just get in the way of sliding the rice around and out of the pan, greatly increasing the chances of uneven cooking and a broken pancake. You can use nonstick, but a well-seasoned carbon steel skillet is my pan of choice, since it puts an even crispier crust on the rice. The first key to success is to make sure your leftover rice has cooled (i.e., it really should be left over). If you were to ladle fresh, hot risotto into a skillet, you'd have a hard time turning it into a pancake, since it would be too creamy and wet. As it cools, the rice continues to absorb excess moisture, and the cheese and thick, starchy sauce firms up. The rice, too, goes through an important change during cooling—its starch "retrogrades," which means the molecules recrystallize. This is the same process bread goes through when it goes stale. It's important here because retrograded rice crisps up even more intensely than freshly cooked rice does (this is also why par-cooked rice is sometimes a popular choice for dosa batters). The hardest part of the whole process is keeping the pancake together as it cooks, and especially when flipping it. Risotto doesn't have an egg or any other kind of binder in it, so it tends to crumble at first. But if you keep patting it down with a spatula as it cooks, and swirling it around in the pan to minimize hot spots and help it brown evenly, it will eventually take on the proper pancake shape. Flipping the risotto can be especially tricky. I've tried it the more classic way, in which a plate is inverted over the skillet and then they're both rotated rapidly, but I've had my pancake fall apart too many times to recommend this; there's just too much of a drop due to the skillet's depth to guarantee success. Easier is to very carefully slide the pancake out of the skillet onto a shallow plate, then invert another plate on top of that; because the plates don't have the higher sides of a skillet, the risotto pancake is sandwiched between them much more tightly. Once flipped, it hardly has any distance to fall to settle on the bottom plate. Then you can just slide the pancake right back into the skillet to finish the other side; if you lightly grease the plates first, even this sliding should go off without complication. And if, for some reason, your pancake does get messed up, just patch it as best you can, pat it back into shape once it's back in the skillet, and carry on. To finish, slide the risotto pancake onto a serving plate and shower it with grated Parmigiano-Reggiano. If you're like me, you may just start making risotto all the time, just for the leftovers.